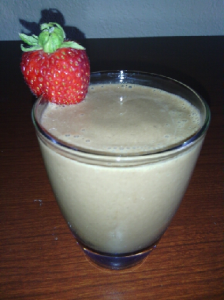 You are here: Home / Recipes / A Healthy Chocolate Shake! Warm weather is coming and we know that sweet treats can be tempting. Instead of a something laden with sugar and other processed ingredients, try this take on a commercial milkshake. 3. Add in almond milk until you achieve desired consistency.